A four-story, mixed-use development brings shopping, a restaurant and health care to Bellevue's Wilburton neighborhood. 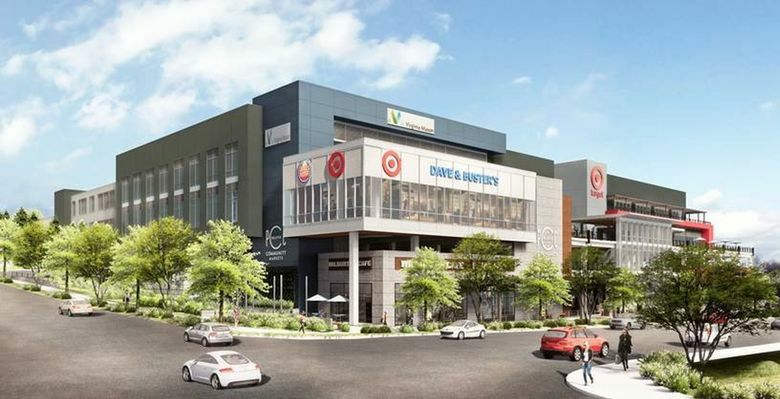 A new PCC Community Markets store will join a small-format Target, a Dave & Buster’s restaurant and a Virginia Mason medical clinic in the under-construction Wilburton Village project in Bellevue. The 161,600-square-foot new retail space adds to a stretch of car dealerships and hotels along 116th Avenue Northeast, on the west side of the Wilburton neighborhood, a former logging camp bounded by Interstate 405 to the west, Highway 520 to the north and Kelsey Creek Park to the southeast. For PCC, the store will be its fourth on the Eastside, and, when it opens in 2020, the local grocery co-op’s 16th store in the region, up from 11 outlets today. Last week, PCC opened a new location in Burien. The retailers mostly fill out the second phase of the Wilburton Village development, a project of KG Investment Properties, a Bellevue-based commercial real estate developer, and Principal Real Estate Investors of Des Moines, Iowa, with a portfolio including $77 billion in assets. It’s across Northeast Fourth Street from the first phase, which opened in fall of 2016 with an REI, Trader Joe’s and HomeGoods. The four-story phase two, expected to open in spring 2020, will include about 700 parking spaces and access to the Eastside Rail Corridor bicycle and pedestrian trail.